Variety reports that Anna Faris, Dan Akryod and Justin Timberlake are gearing up for roles in the live action Yogi Bear film. 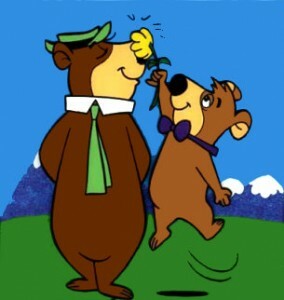 A mainstay of the Hanna-Barbera collection of characters, Yogi is the lovable bear who can talk and spends his time stealing picnic baskets while outwitting the park warden. Dan Akroyd is poised to voice Yogi Bear while Timberlake is to be voicing Yogi’s sidekick; Boo-Boo. Another combination of CGI and live-action movie? Do these ever turn out well? Maybe it’s because it’s so early in the morning but I can’t think of any good cgi live action movies. All I can think of are turds like Garfield and Alvin and the Chipmunks. Marvel's Second "Shadowland" Teaser is much more interesting than the first.